Eureka, its time for another recipe from the brewers logbook. 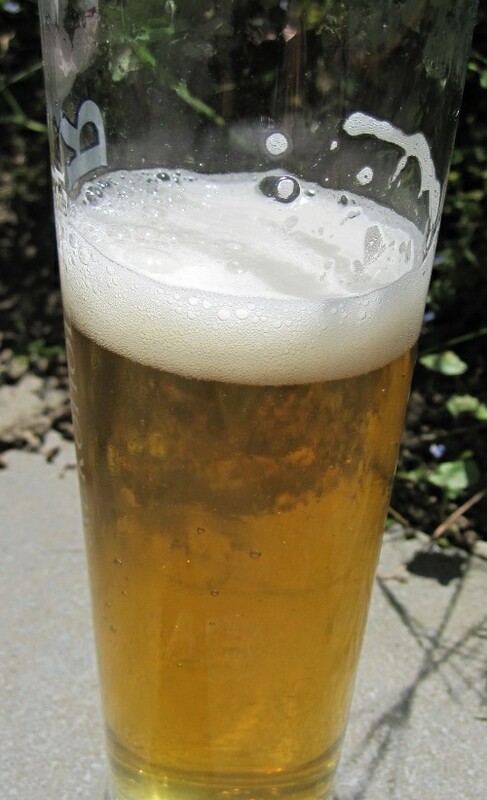 The recipe of the day is a Kölsch. This is a beer style which is brewed around Cologne, Germany. For further details about this beer style, please have a look at the BJCP guidelines about Kölsch. Some information about the name of the beer. There is a huge cathedral in Cologne, called Kölner Dom. It is pretty nice and the view from the top of the towers is just beautiful. Visit the Cathedral if you are around Cologne some day. It is really impressive. As a lot of other cathedrals, the one in Cologne has bells. And the Gloriosa was the heaviest bell in the Cathedral until 1918. Its weight: nearly 27’000 kg! Some of you might already guess what happened with the bell in 1918… Its metal was used to create weapons for the First World War. Really sad in my opinion. However, as I came across the story of the Gloriosa bell I knew that this is a name for a Kölsch beer. The recipe itself is rather easy. Some Pilsner, wheat and Munich malt. Some Perle hops for bittering and Saazer as aroma hop. All fermented with a typical Kölsch yeast strain. 08/25/07: Brew day number ten. You might have noticed that some of my beers have a somewhat complicated mash schedule compared to other recipes. One explanation for such complicated mash schedules is the malt quality back in the old days. Some of the malts had a higher protein content than modern malts do. It was therefore necessary to do a protein rest at around 45-53°C. This meant you needed a kettle you could directly heat or do decoction mashing. As already mentioned, a lot of the modern malts do not need a protein rest anymore. A single saccharification rest therefore is all you need to do nowadays. Several step makes the whole resting pretty labor intensive since you always need to stir the mash during the heating steps to prevent scorching. You might have already seen in previous posts that I have a pretty nice stirrer (Fig 1). So no stirring for me anymore. However, the stirrer broke last year and I haven’t fixed it yet… The next thing I build myself was a PLC (Programmable Logic Controller). 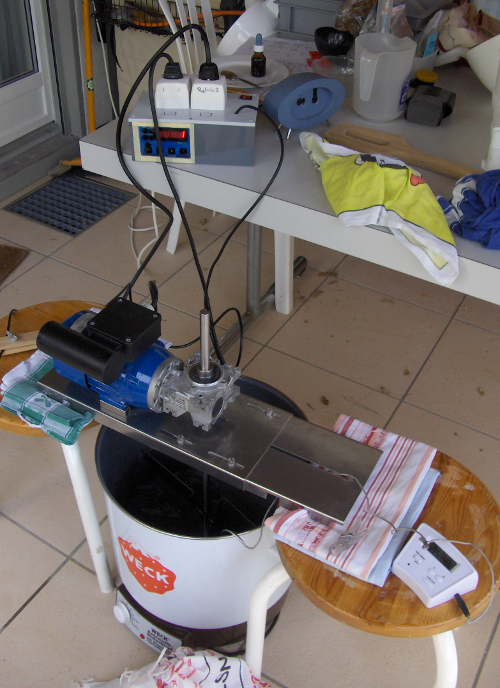 This device can be seen in Fig 1 (the grey box on the table). There are two exits where I plug-in my stirrer and my kettle. 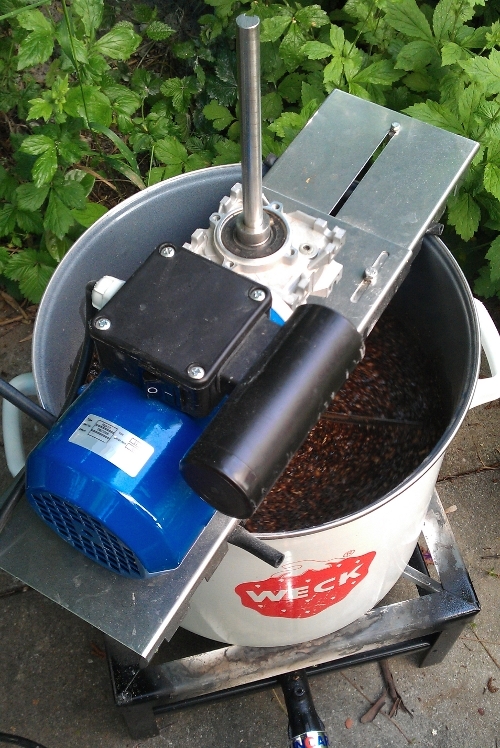 The stirrer is always on, the kettle is regulated to keep the temperature (which is measured by a probe). 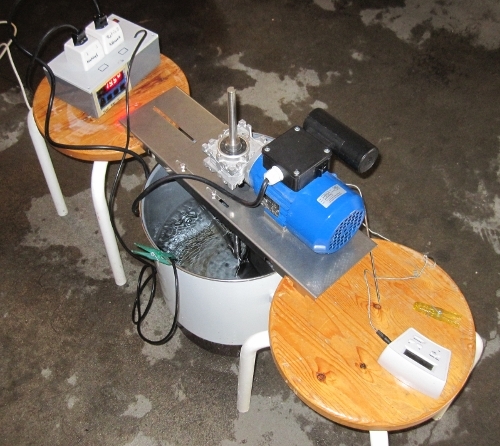 However, my mash kettle can keep the temperature at a constant value as well. You can set the temperature at the bottom with the white nob (Fig 1). What makes the PLC special is the programs you can store. The only thing I have to do now is feed the mash schedule into the PLC, press start and mash in at the right temperature. And stop the program at the mash out temperature. So no complicated mash schedules for me anymore. And yet again, I needed some parts of the PLC for my kegerator… so no PLC anymore. I just need the right parts and one hour of work and the stirrer and PLC are working again. The kegerator was way more important than the PLC… Now back to the brew day. The mash went great… iodine test was negative. 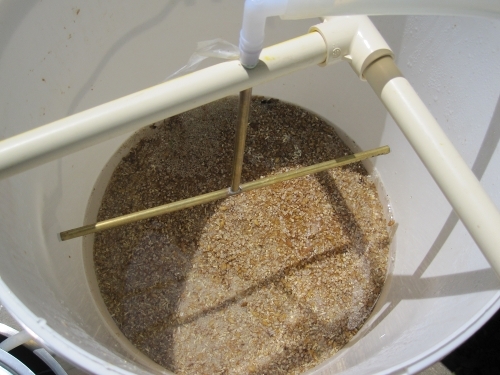 Then transferred the whole mash into my lauter bucket and collected the wort (Fig 3). Then sparged with 20 L (5.3 gal) of water. 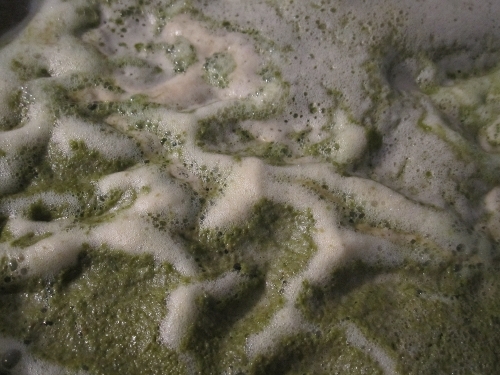 Added the Perle hops as the wort begun to boil and added the Saazer hops later on (see recipe). Cooled the wort down for the fermentation and added a starter of Wyeast’s Kölsch (#2565) yeast strain. 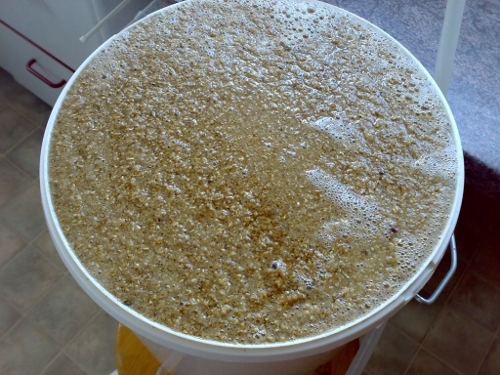 I then left the fermentation bucket at 20°C (68°F) for 14 days. 09/08/07: Bottled the beer with cane sugar to a carbonation level of 2 vol. Then left the bottles carbonate and mature for nearly 4 weeks. Unfortunately, I do not find my tasting notes for this particular batch anymore… No problem, I did a second batch of this recipe (batch #14) with some tasting notes. Nevertheless, the beer looked quite amazing (Fig 4). Looking at this beer makes me thirsty. I will head to my kegerator (see, the kegerator is much more important than a PLC) and pour myself a glass of fresh beer. I hereby close this post. Stay tuned for further recipes. Eureka, I begin the yeast basic post series with today’s post which is all about the family tree of Brettanomyces. The main message here is how the different Brettanomyces strains are connected to each other and which strains are the same. Be aware, there is a lot of science in this post. Lets begin with a question. How would you determine the relationship between people? Easy question but the way to do it is not that simple. Of course you could ask some of the people about their relationship to each others and then construct a family tree. You might fail with this approach if you have like: Who is the father of this child? What if you get two fathers? How would you construct a family tree then? In such cases, genetics helps. One way to solve this problem would be to sequence the childs and the two fathers DNA and compare them. One would expect less differences between the DNA of the child and father because the child inherited part of the fathers DNA. This approach can be used to construct relationships and build a family tree (phylogenetic tree). In this case you take the same DNA parts of different people, in our case here Brettanomyces, and compare them. However, there is a major difference. The family tree of Brettanomyces is very old with a lot of generations. Imagine that your parents lived a million years ago and raised an ancestor of you back then. This might sound silly to you because they raised an ancestor of you and are still your parents. Normally, you would call your direct ancestors your parents, right? However, in this case you are a clone of your ancestor with nearly the exact same DNA. Meaning, the DNA of all your ancestors back to your parents are the same as yours today. If you would compare all the DNA of all your ancestors back to your parents, you might find only very minor differences. Only your parents will have different DNA. And this makes it possible again to create a phylogenetic tree. I like to emphasize that there could be differences in the DNA between the ancestors for sure. A lot of mutations happen every day in a cell. Can’t remember the exact number but its huge… Anyway, there is the probability that some of the DNA differ once in a while. Some changes might work, some are lethal for a cell (they mess up the functionality of a cell). This already shows that only some mutations are inherited (lethal mutations can’t be inherited). To get back to the phylogenetic tree. The problem now is to choose the correct piece of DNA. If you chose a part of DNA with a lot of mutations, you would not be able to construct a phylogenetic tree because the changes in the DNA due to inheritance is interfered with random mutations. This leaves regions where only a few mutations happen during time. Additionally, if you chose a region were not only few mutations happen but some of them get lost due to lethality, you have yourself regions were only very few mutations happen at the end. I will not go into further detail now. At the end you chose regions in the 26S ribosomal subunit or regions between different rRNA, called internal transcribed regions (ITS). The ribosome is the machinery that produces proteins in a cell and is therefore very important. If the ribosome does not work (due to mutations for example) it can’t synthesize proteins and the cell might die. A ribosome consists of several rRNA (ribosomal RNAs). Imagine the different rRNA to be kinds of Lego bricks forming a functional ribosome at the end. One of them is the 26S rRNA. Just a clarification for all the people out there wondering about the 26S and not 28S (typical for eukaryotes), the 26S is the homolog of the 28S in yeast, plants and protozoans. At the end, you chose the ITS1 and ITS2 or the 26S gene for the phylogenetic tree. Enough of theoretical background here. Lets get into the practical part. After you got yourself the sequences, you compare them. This is called alignment in bioinformatical terms. How an alignment looks like is shown in Fig 1. What you see there are the different sequences from the different Brettanomyces species at the top with the labels on the left site. Each of the four bases of the DNA (A,T, G, C) has its own color to make it easier for the human eye to compare. Lets make an example. Lets have a look at the very left column. The sequence of B. naardenesis starts with an A, all the other species have a G at this position. If all the bases are the same, like in the next column, you get a 100% conservation at the bottom. Meaning, that all the bases in the different species have the same base at this position. In our example, there is one A and 5 G’s. The conservation here is not 100%. Now, the interesting parts here are the regions with a lower conservation. These are the regions were changes happened during the time and where you can gain information about the relationship. The next step is to create a phylogenetic tree from this alignment. I have no idea how the program does it exactly. I assume the program looks for patterns how the different conservation states occurred. What you get at the end is the following picture (Fig 2). What you can see here is that there are four branches. One for B. custersianus, one from B. naardenensis, one shared by B. clausenii and B. anomalus and one shared by B. bruxellensis and B. lambicus. Each branch represent a family, called species in biology. Basically, there are four different Brettanomyces species. There is another one, B. nanus, but I could not find any ITS1/2 data for this particular strain. Another thing here is that B. bruxellensis, B. lambicus and B. clausenii and B. anomalus are from the same species. B. bruxellensis and B. lambicus, B. clausenii and B. anomalus are synonyms for the same species. I had a look at the alignments of these two strain pairs and they were exactly the same (100% conservation). Genetically, the B. lambicus/B. bruxellensis and B. clausenii/B. anomalus ITS regions are the same. All of you out there working with Brettanomyces might know that the flavor profile of B. lambicus and B. bruxellensis are not the same. Looking only at the flavor profile you might categorize the two strains in different species. However, this is not the scientific way to categorize strains into species. Its done on a genetic level like shown here. The process is basically the same as mentioned above, this time with the 26S rRNA regions. Now with the B. nanus, you can see now that there are five different Brettanomyces species (Fig 2). B. bruxellensis (B. lambicus as synonym), B. anomalus (B. clausenii as synonym), B. custersianus, B. nanus and B. naardenensis. To summarize, there are five different Brettanomyces species accepted today. Of course there could be new species to be discovered. To be recognized as a new species it has to form a new branch in the phylogenetic tree, not sharing an already existing one. I was quite fascinated how easy it is to get yourself a phylogenetic tree of Brettanomyces within a reasonable amount of time. Of course, there are publications about this already. However, it is much more exciting to be able to replicate the results yourself. And a very good exercise. I hope it is somewhat clear what happened here and how information of DNA sequences can be used as well. Next posts to come: general overview about Brettanomyces, further information about the individual Brettanomyces strains and another genetic post about the comparison of a Brettanomyces against a Saccharomyces genome. Stay tuned! Eureka, it time for another recipe review. Today’s recipe is my third attempt to brew an Irish stout. I had a lot of sparging troubles in my first attempt, second one turned out not the way I expected it to taste like and the third one was pretty awesome. Unfortunately, this particular brew got no name… Hence the name Irish Dry Stout. However, there is this black beer brewed in Ireland that I used as an inspiration. Lets go through the recipe. 05/21/11: Another brew day begins. All the malts went through the mill except the barley flakes and oatmeal. The barley flakes and oatmeal are in this recipe to give the beer a more pronounced body and get the creamy head you expect from a stout. The acidified malt was to lower the pH of my brewing water. Mashed in at 66°C and let the mash rest for 90 min. I used my stirrer to improve the efficiency a bit and the iodine test was negative after the 90 min rest. 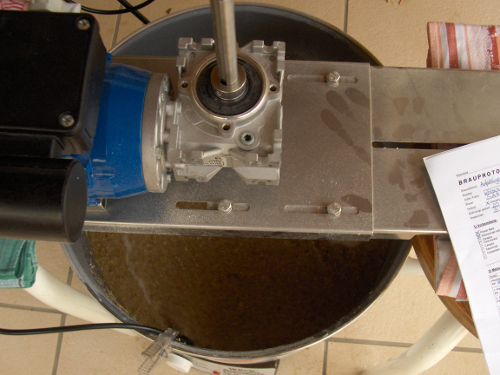 Then proceeded with the fly sparging process and added the hops as mentioned in the protocol above. After the boil, I transferred the hot wort into my whirlpool kettle and cooled it down to approximately 20°C (68°F). I then pitched a healthy Irish ale yeast and off went the fermentation. 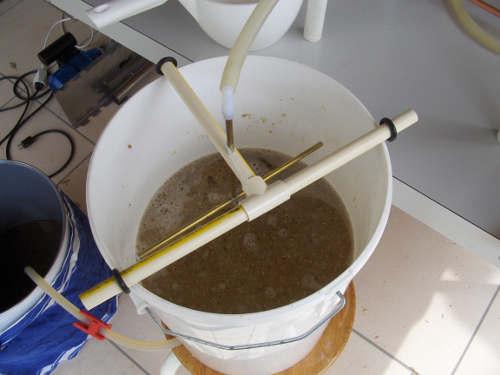 05/27/11: Transferred the beer into a keg after the yeast reached the final gravity of 3.8°P. I then added table sugar (90 g to approximately 19 L of fresh beer) to reach a carbonation level of 2 vol. I left the keg carbonate for one week and stored it cool for three weeks. 07/03/11: First tasting after four weeks of maturation. Aroma: Could detect a lot of coffee and chocolate notes. Roast notes are pretty easy detectable. No fruit notes. Typical dry stout aroma. Appearance: Black appearance with hints of opaque. Beige, frothy head. Brilliant and good long-lasting head. I have to mention that I do not dispense the stouts with nitrogen. Flavor: Roast, coffee, chocolate and licorice as well. Finishes like a well made coffee. Pretty dry and way to easy to enjoy… Slight sourness on the tongue. Mouthfeel: Light to medium body, average carbonation level, short and very smooth aftertaste. Overall Impression: Well, this is a typical dry stout. Very refreshing! A bit too dry for my taste. I would love to have a more pronounced backbone. However, a dry stout is dry… Really like it though! 08/16/11: Second tasting. This time against Guinness Draught. I just noted the differences below. 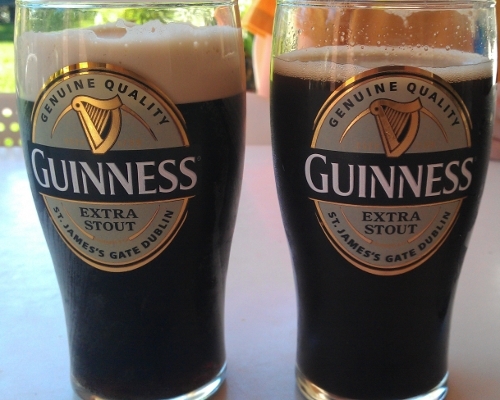 Fig 2: Guinness Draught on the left side, my own version in the glass on the right. Aroma: The original Guinness had a very pronounced metallic aroma. Way less roast and coffee notes. Maybe the Guinness Draught (from a can) was not the freshest example anymore… Although I could pick up the metallic aroma in previous Guinness tastings as well. Appearance: The Guinness was a bit lighter in color and the head was way better. I have to mention, I bought the Guinness in a can with the nitro widget and do not use nitrogen to dispense my stouts. Flavor: The Guinness was a bit sweeter and less roasty. Both stouts had a hint of a sourness and were pretty easy to drink. Mouthfeel: Same body, same carbonation level. My version had a more bitter and roasty pronounced aftertaste. Overall Impression: Both stout were very similar. The only difference I could pick up were some minor differences in the color and the freshness. In my version, the aroma and flavors were much more pronounced. I would not say that my recipe above is a clone recipe for the Guinness Draught but it gives you a beer that is quite similar to the commercial example. Eureka, its time for yet another recipe from the past. This time a Pilsner style beer. 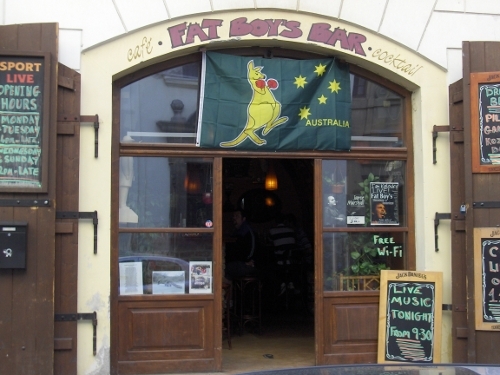 All started with a study trip to Prague and České Budějovice (aka Budweis) in 2008. I don’t want to write a trip journal here but if you have the opportunity to visit Prague, just go for it. It is such a nice place to visit. 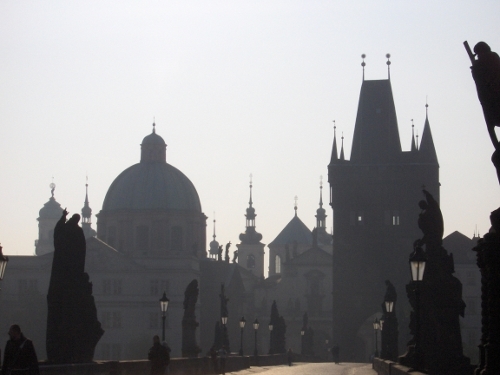 After our one day stay in the south of the Czech Republic, we traveled north and stayed in Prague for several days. We both attended the city tours organized by our school and spent our spare time in different bars again… The beer was very cheap and really good. I am not into Pilsner style beers anymore but I would still order a Pilsner Urquell directly poured from a cask. Just amazing! I went home with a lot of beer, a headache and decided to give this particular style a go to replicate a Pilsner Urquell. The recipe is a slightly changed version from SIOS (recipe in German) and brewed it in 2010. 05/13/10: Brew day number 13 begins. It is so cold outside that I did this batch in my garage. PLC and stirrer did their job wonderfully, iodine test was negative after the last rest at 73°C (163°F). Then transferred the mash into my lautering bucket and begun to sparge. Then boiled the wort for 75 min with the additions of the hops according to the protocol above. Then cooled the wort down to 18°C (64°F) and added the yeast. Due to the very cold weather, I hoped the temperatures outside would stay low to cool down my cellar. Unfortunately for the beer, the weather changed and the temperatures in the cellar rose to 15°C (59°F). I therefore had to ferment the beer at a higher temperature than originally planned. The fermentation went not that well. My original gravity was 12.7°P and the gravity was still at 12.4°P after seven days… The gravity dropped to a final 5.5°P. A pretty slow fermentation although fermented at relatively high temperatures for a lager fermentation. 06/06/10: Bottled the beer after a primary fermentation of 24 days to a level of 2.5 vol. 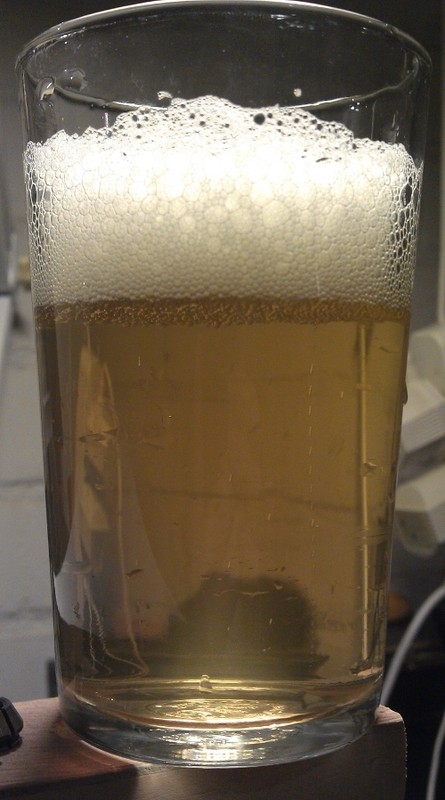 I then left the beer carbonate for nearly two weeks and left it mature at 15°C. Luckily, I bought myself a refrigerator in the summer of 2010 and so the maturation of the beer could take place at lower temperatures. Aroma: Very hoppy aroma. Bready, sweet and honey aroma. DMS!!! Appearance: Yellow, clear with a white foamy head on top. Flavor: Hint of hops, some sweetness and nice bitterness. Again, DMS detectable. Mouthfeel: Light body, lively carbonation level, short bitter and malty aftertaste. Overall Impression: Despite the DMS, the beer was not that bad. Nevertheless, the DMS made it pretty hard to enjoy and I dumped the last remaining bottles in 2012. Changes and things I would consider important for a next batch: First, get enough viable yeast and ferment it at the appropriate temperature. I now own a temperature controlled fermentation chamber for such reasons. 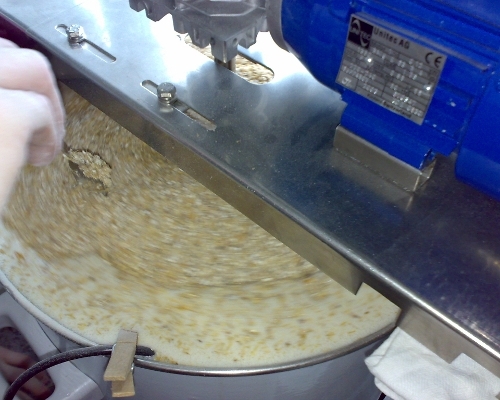 Second, increase the boil to a full length of at least 90 min to thrive of any DMS precursors. And chill the wort immediately after the whirlpool to minimize the DMS formation. Third, adapt the technique. Maybe go for a decoction mash, use an appropriate water profile, Premium Pilsner malt or even floor malted barley instead of normal Pilsner malt and use very fresh whole hops. Maybe even mature the beer or some of it in wooden vessels (as done by Urquell). 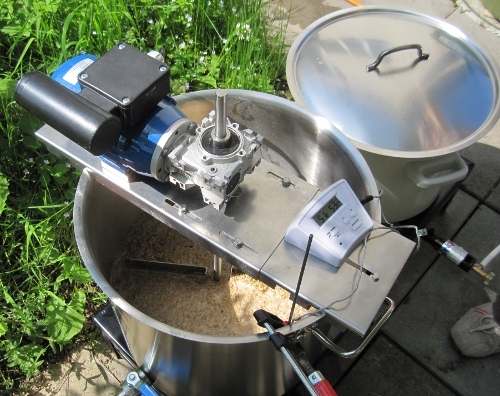 To summarize, brewing lager beers is not that easy. There are a lot of things to consider and taken care of. If you have a flaw (such as DMS) it will be easily detectable since theses beers are rather subtle in the aroma and flavor. On the other hand, it is very rewarding if you can brew such a beer (been there). Once again, I am not very into lager beers and such anymore but tasting a freshly well made Pilsner beer is very different to the ones you buy in bottles. Stay tuned! Eureka, it has been a while since the last post about isolating some wild bugs from a commercial beer. Luckily, there are still some beers in my cellar with bugs I would like to isolate (Orval, Lost Abbey, BFM, Cantillon, Jolly Pumpkin…). The beer I am talking about today is from a Swiss brewery called Les Trois Dames (The three women). 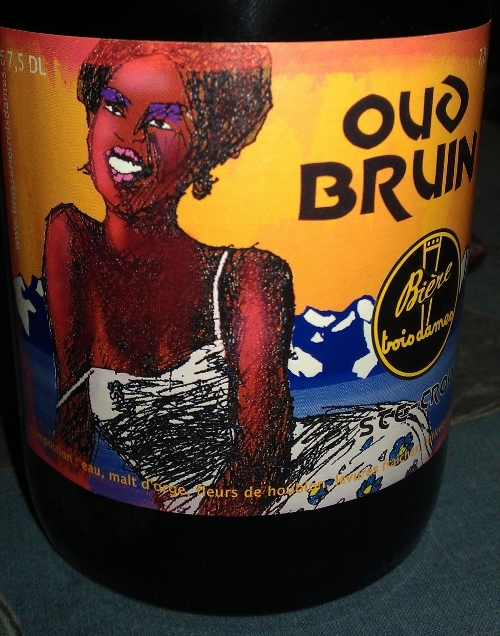 This brewery produces an Oud Bruin (Flanders Brown) made with apricot wine. The beer comes with an ABV of 7.2%. Maybe some of my tasting notes first. Appearance: Red-brown color, clear appearance, 1 finger tan head with some carbonation. Nothing special here. Mouthfeel: Light body, average carbonation level, pretty dry and sour finish. Overall Impression: There is the right amount sourness in this beer and the aroma of this beer promises a lot. Unfortunately, the flavors speak another language. The beer has a very limited complexity in my opinion. Maybe the beer was too young? Only a second tasting could tell. To summarize, this is a pretty nice beer and because this is a beer made from a Swiss brewery, it is a winner for me for sure. I would give this beer a rating of 85 out of 100. I am a bit disappointed about the lacking apricot notes. I should get myself a bottle of apricot wine one day and compare the apricot flavors there. Maybe the apricot flavors are already very subtle in the apricot wine? Anyway, this post is about the bugs in the beer. What I did is already a standardized technique for me to isolate some bugs from such a beer. I made myself a small DME (dry malt extract) starter and dumped the dregs of the beer in there and left it for some days. 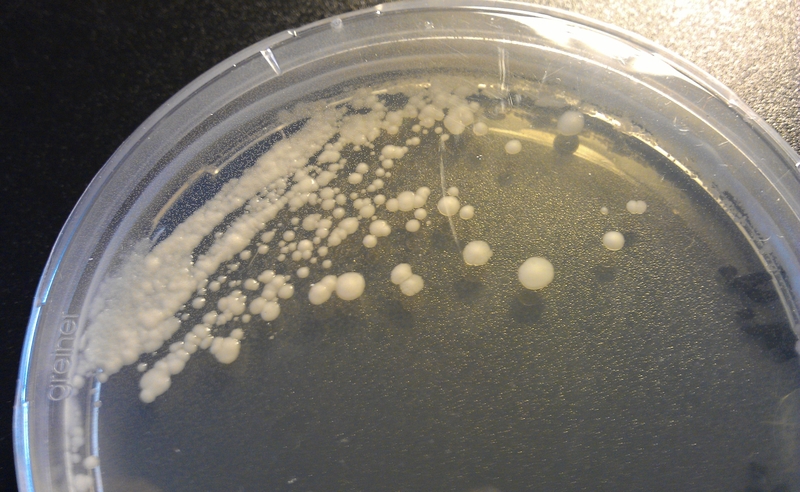 Approximately a month later, I plated some of the starter liquid on some Sabouraud agar plates and waited… Eleven days later, there were some colonies visible on the agar plate (Fig 2). The colonies morphology: White, not glossy, wavy margin, convex elevation, circular and the plate had a hint of an acetic acid smell. The acetic acid smell already made me wonder what I got myself here. I then picked a single colony and had a look at it with my microscope. 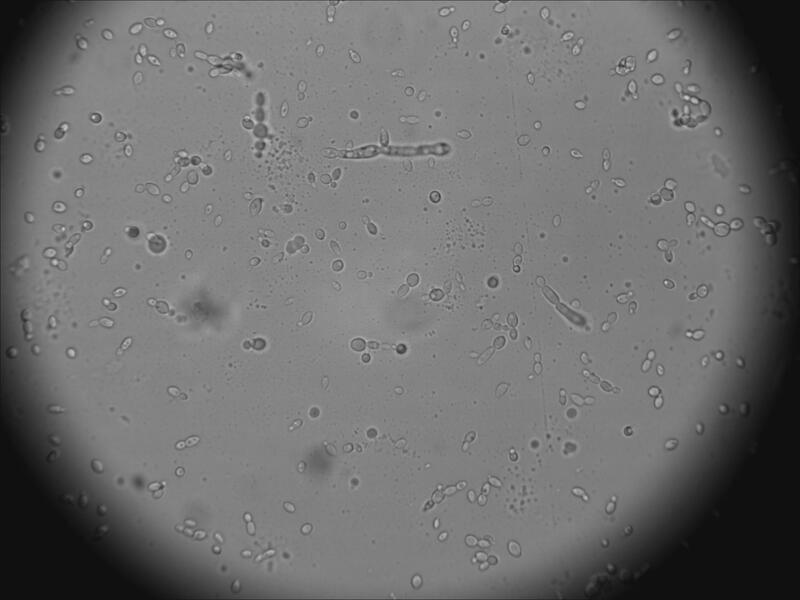 First of all, due to the size of the cells, I assume that all the cells visible in the following pictures are yeasts. I could observe some oval formed cells and some with the mysterious vacuole (Fig 3). And yet again, some cells which adhere to others (Fig 3). 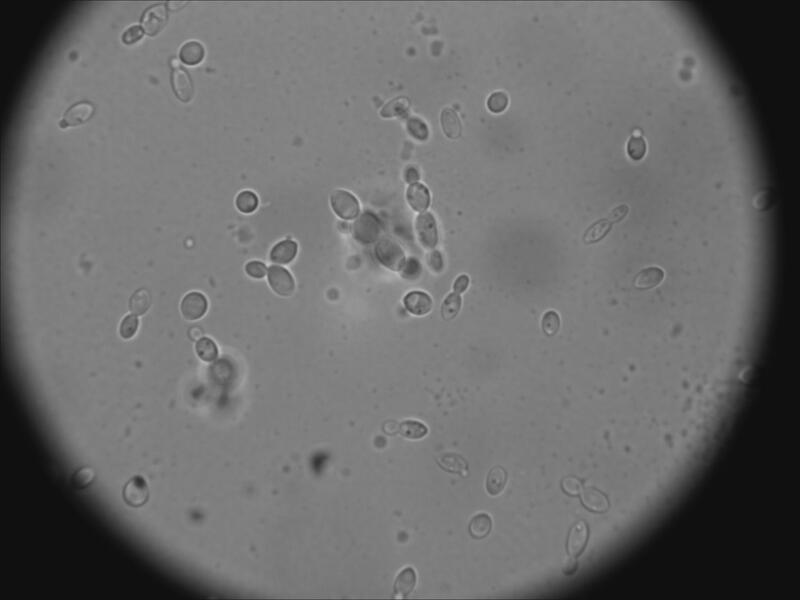 For me some of the cells in Fig 3 look like normal brewers yeast (Saccharomyces cerevisiae) and others don’t. Then again, I could observe some elongated cells (Fig 4). I already have an idea about these cells but will have to do further research first. Lets move on to the picture at a higher resolution. There are these dark spots again which I could observe in Brettanomyces bruxellensis before (Fig 5). My conclusion from the observations. I assume that I got myself some Brettanomyces bruxellensis and maybe some other Brettanomyces species. Some Saccharomyces cerevisiae could be in there as well. I guess this is all I can tell you about the bugs right now without doing any sophisticated lab tests. Nevertheless, I once again could show that it is possible to harvest some wild yeasts from a bottle. My next steps concerning wild yeasts will be further investigations about the elongated cells as it can be seen in Fig 4. There is a hypothesis in my head what these cells might be and I already found some promising evidence for my hypothesis. Another running project is to isolate the bugs from a Cantillon Kriek. Will post about the results for sure. By the way, the starter I made with the dregs from the Les Trois Dames bugs had no pellicle. Stay tuned for further yeast ranching experiments. Cheers! Eureka, its time for yet another recipe. This recipe is actually a re-brew of a previous recipe. So no long story today. Had to do some minor changes (substitute the Saazer hops with Tettnanger) and the gravities were a bit different to the previous batch. Lets go through the recipe. Back to the brew day. The resting went great, the motor did his job pretty well. Unfortunately, the iodine test was not negative clearly enough so we went for another 10 min rest at 73°C (at the end 30 min in total) to be sure. Then transferred the mash into the lautering bucket and collected the wort. The hops went in the boiling wort and boiled the wort for 80 min and cooled it down and pitched some of Wyeast’s #2565 Kölsch yeast. 14/06/10: Bottled the batch after 14 days of primary fermentation. Carbonated to a level of 2 vol and then left the bottles carbonate for a week and then transferred the bottles to a cooler place (15°C (59°F)) to mature. Appearance: Yellow color, clear, persistent white head. Looks like a typical Kölsch. Flavor: Malty sweet, lightly bitterness and very fruity (apple). Very nice. Mouthfeel: Light to medium body, average carbonation level, short and lightly sweet aftertaste. This makes this beer a really thirst quencher. Overall Impression: Well, another nice brew. Quite easy to drink. I did the tasting with the BJCP guidelines (6C Kölsch) booklet and tried to compare this brew with the stylistic accuracy. My verdict: Exemplifies style well, requires some fine-tuning. What changes would I consider for another batch? 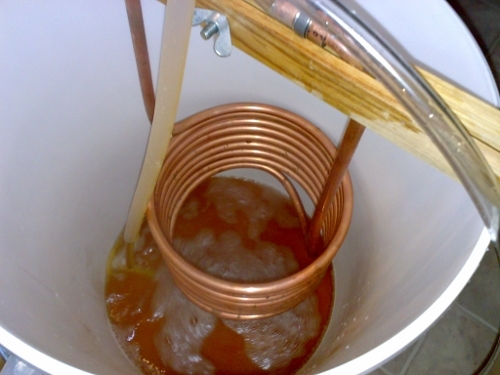 Include a secondary fermentation step. Maybe do a two-week primary fermentation followed by a two-week secondary fermentation step. This could decrease any acetaldehyde. 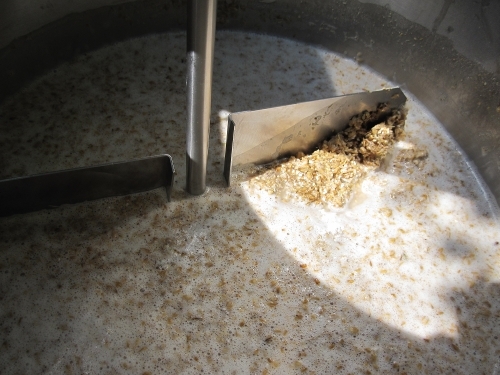 Acetaldehyde is formed by the yeast by metabolizing glucose which leads to a green apple aroma in the finished beer. Leaving the beer longer on the yeast cake would decrease the level of acetaldehyde due to further metabolism. Anyway, let’s go through the recipe. I added some Caramunich to give it some color and used some acidified malt to lower the residual alkalinity of my water. The Vienna malt backbone should lead to a very malty beer and the Carapils improves the head. Some information about the mash schedule. The first rest at 45°C is a protein rest to improve the head of the beer. Then followed by two different saccharification rests. Finished with a mash out at 78°C. 04/28/07: Brew day number nine. 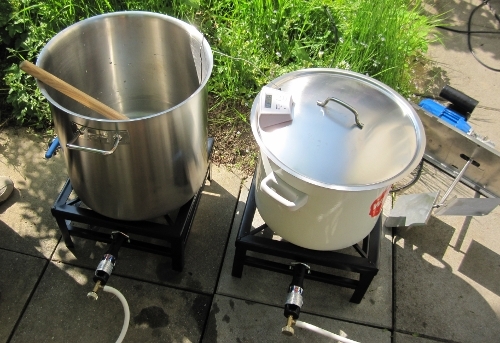 I had a 25 L lauter bucket and a 28 L kettle back then and this recipe filled the bucket and kettle up to the very top (Fig 1 and Fig 2). However, all went according to the protocol and no overflows and such happened. At the end, I collected 25 L of wort after the boil. I originally planed to get 20 L but hey, more beer is always appreciated. Aroma: Very malty aroma and some hop notes as well. Smells pretty awesome. Can’t remember if there were any ester notes from the English yeast strain (S04). 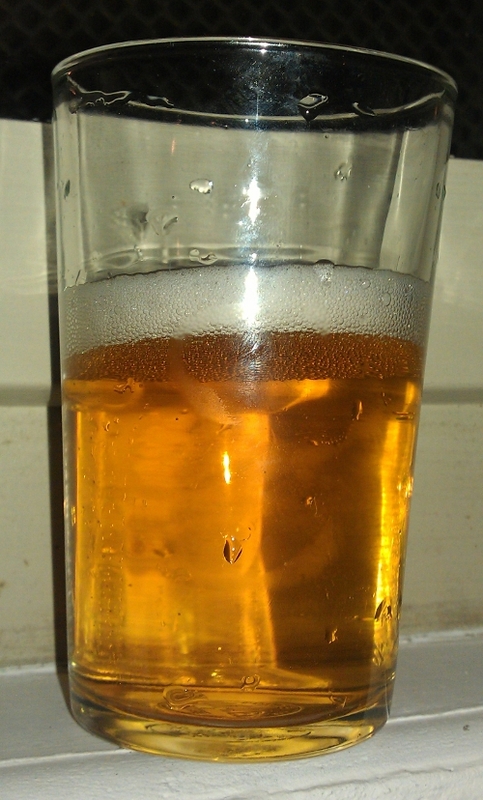 Appearance: The beer is clear and a appears in a very golden color. Pretty nice white head. Looks like a Vienna Helles should look like. Mouthfeel: Medium body, average carbonation and a malty finish. This makes it very easy to enjoy. Overall Impression: Pretty solid beer. I just thought about to do another batch of this particular recipe sometimes. It seems to be really refreshing and easy enjoyable. Although, I would probably change the yeast and go with either a bottom fermenting or a clean top fermenting strain. Maybe Wyeast’s #2112 California Lager strain would work as an alternative. Please leave a comment below if someone gives this recipe a shot. I am very interested how the beers turn out… Stay tuned for further recipes! 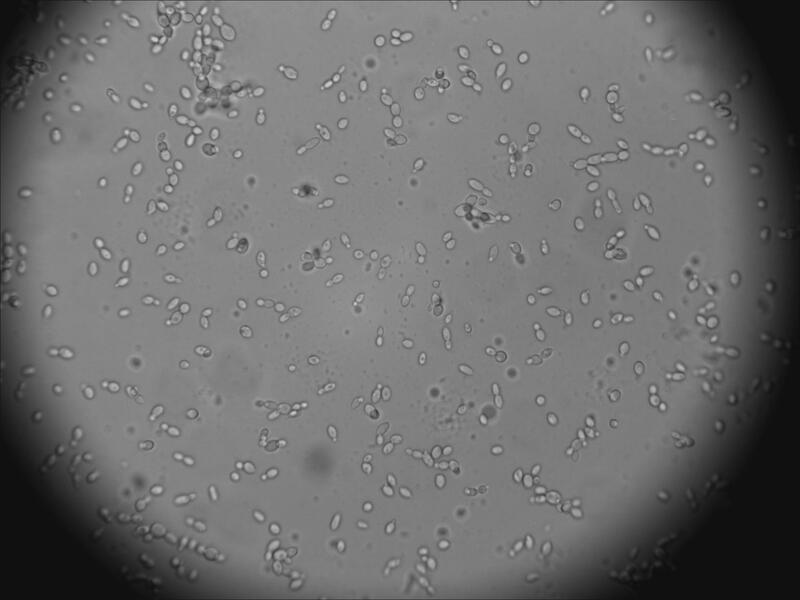 Evaluate starter media to propagate Lactobacillus sp.